New from Ebulobo - Who could be afraid of this crazy wolf? New from Ebulobo – Who could be afraid of this crazy wolf? I was never much into soft toys for my cherubs but I’d have made an exception for this one. He’s a little quirky to look at with his nutty colours and patterns and apparently quite crazy! 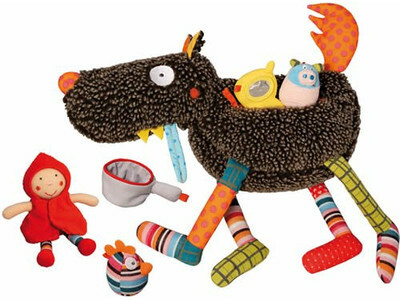 New from French company Ebulobo, the Crazy Wolf play set is a delight. Small children will definitely think he’s crazy when they pull the Crazy Wolf toy’s stomach contents out of its zippered pocket – only to reveal a Little Red Riding Hood doll complete with removable coat, a pig, a duck, a pan and even a mobile phone! Apart from a tummy full of strange objects, this crazy wolf has a tail that crinkles, a squeaker nose and bell in his head. Crazy, we know! Suitable for children aged six months and older, I think it will prompt many smiles and giggles, making it a gorgeous gift for any little person. You can get your Ebulobo Crazy Wolf from Amelie’s Room for $64.95, with delivery available Australia wide.